From the moment I first saw this photo on the Walls Need Love’s Instagram account, I wasn’t able to get the idea of a wallpapered “tile” backsplash off my mind. 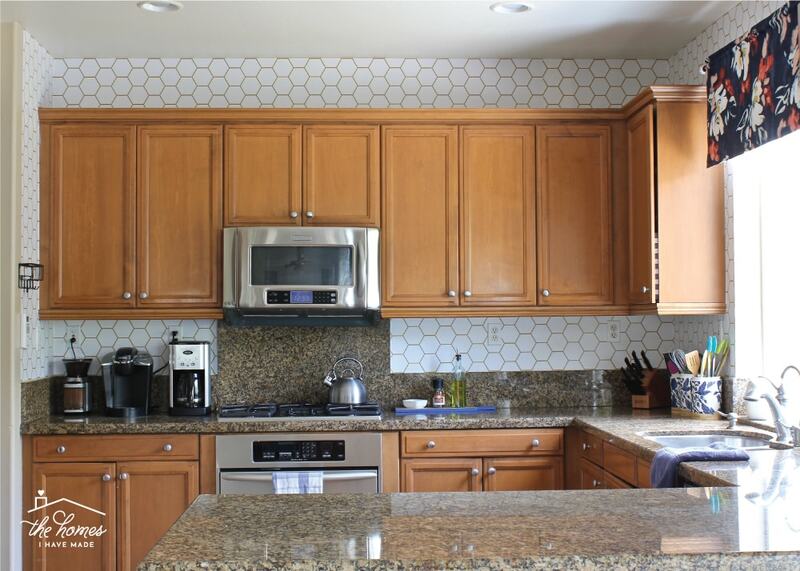 I really loved how the modern geometric pattern looked like tile (great for a kitchen backsplash! 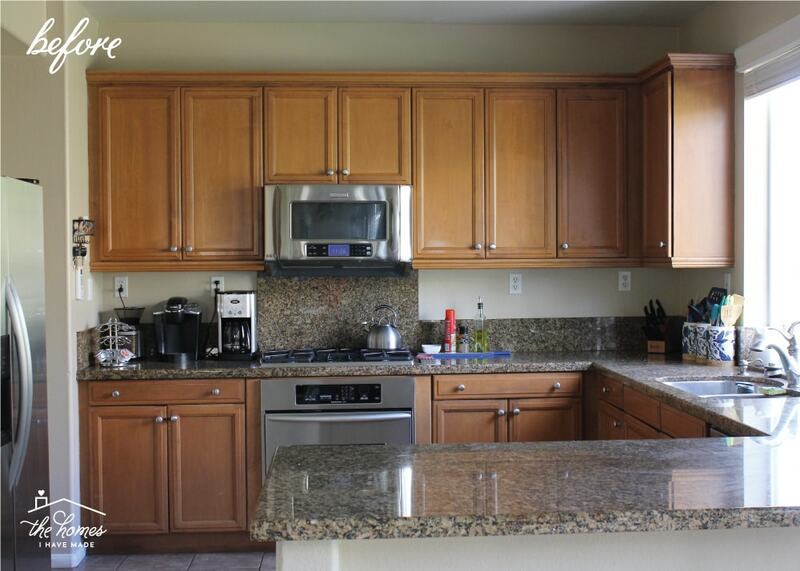 ), but I also had a hunch the colors would play nicely with our brown cabinets and countertops. 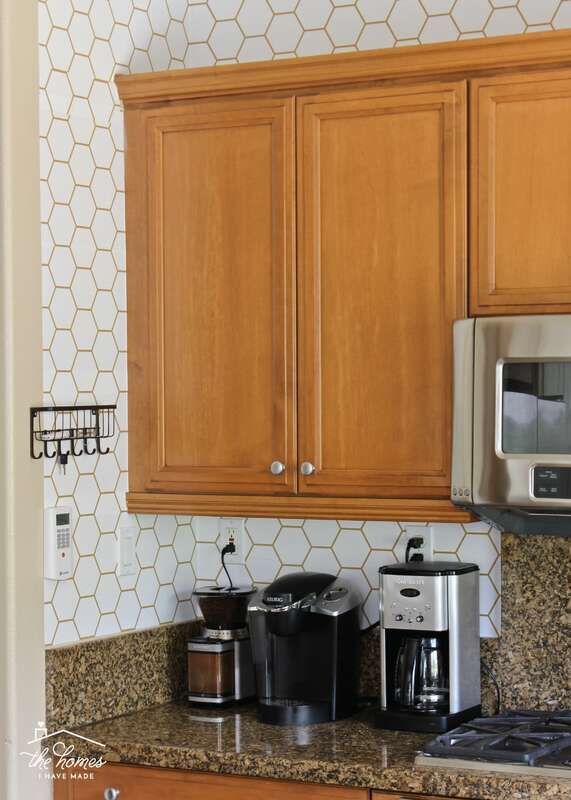 Not only would the white background of hex paper really lighten and brighten our kitchen, but the gold-hued lines were a great match to our honey oak cabinets. After ordering a sample and deciding to go for it, I watched and waited on this paper for months. 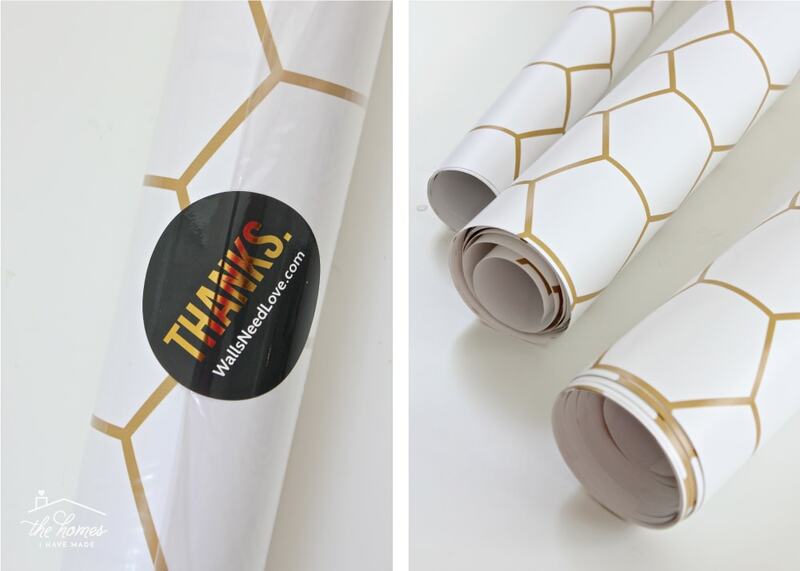 I finally jumped for a few rolls during Black Friday sales (which is one of my best tips for scoring peel-and-stick wallpaper cheap!) and just recently got around to (finally!) getting it all installed. 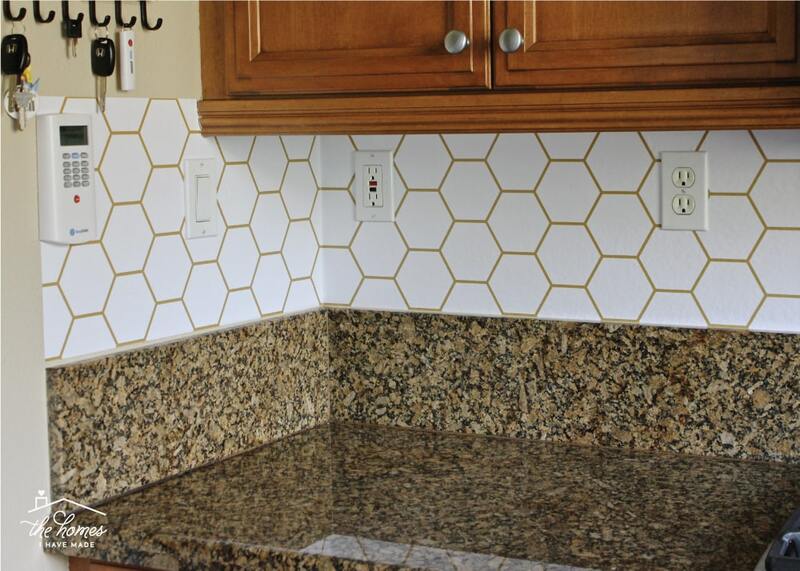 I’ve applied peel-and-stick wallpaper to a ton of different surfaces over the years, but I’ve never done a backsplash…which, as I learned, has some tricky nuisances. 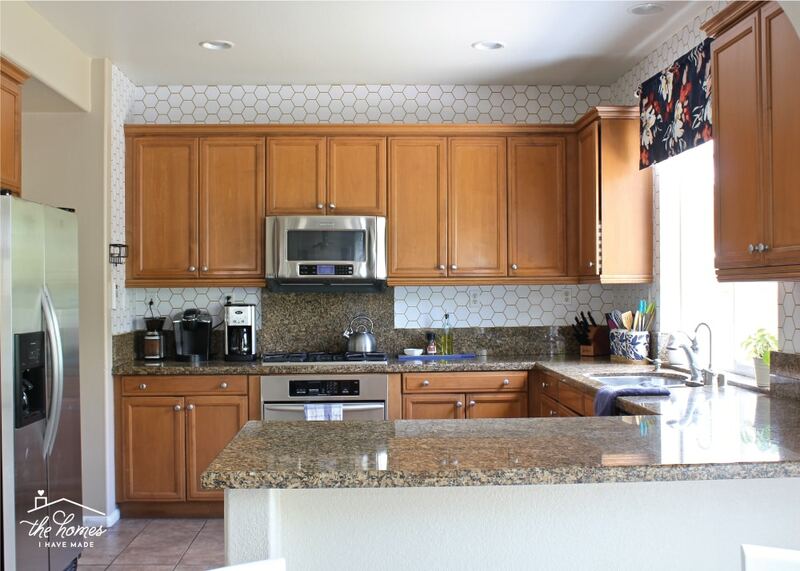 So today…I want to show the transformative effect this project had on our ugly brown kitchen, and also show you how to wallpaper a backsplash with peel-and-stick paper should you want to try it in your own home too! 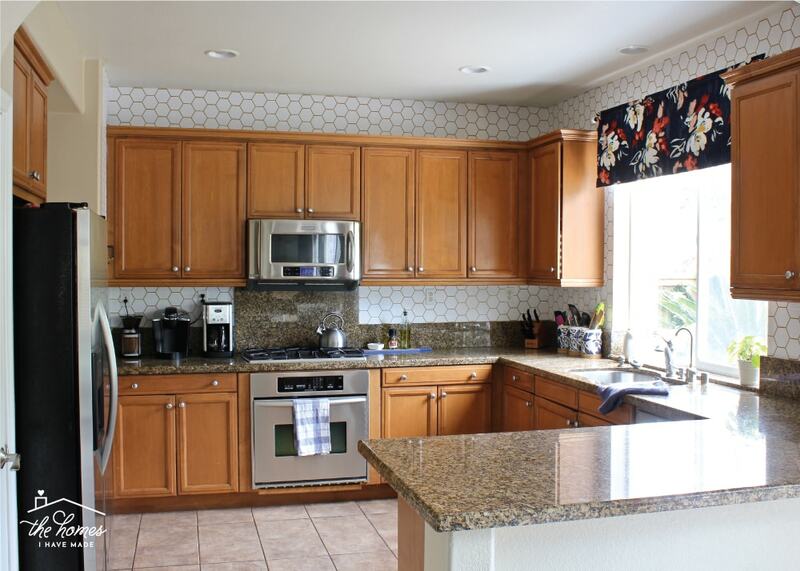 Here is our kitchen before I added the peel-and-stick hex wallpaper. As you can see, it’s a pretty monochromatic space. Admittedly, adding such a strong dose of cool-and-crisp white to this very warm kitchen was a pretty big gamble. But now that it’s all done, I am beyond thrilled I took the leap and went for it. …it’s gone a very, very long well in helping me like this kitchen more! As you can now see, I decided to wallpaper more than just the backsplash, taking the paper all the way to the ceiling (I’ll explain why a bit later). When combined with a new kitchen curtain and the white chairs in the adjoining dining space (seen here and at the bottom of this post), the white actually works! 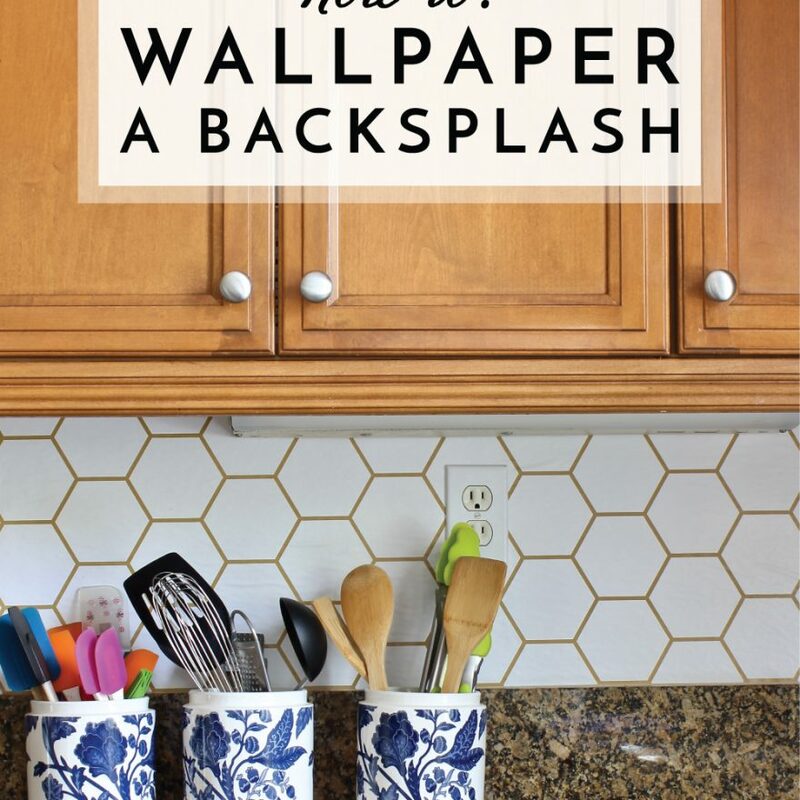 Wallpapering the backsplash definitely turned out to be one of the tricker wallpapering projects I’ve done, so let me walk you through exactly what I did and how I pulled it off! 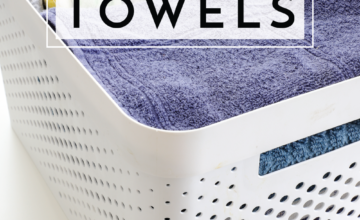 Every backsplash/kitchen may vary, but in general here are the supplies you will need to keep on hand! 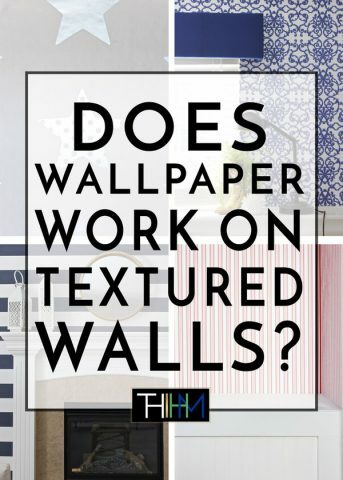 Wallpaper – This project could theoretically be done with any kind of wallpaper (traditional, peel-and-stick, etc). I personally chose the peel-and-stick route here for durability (most papers can be wiped clean) and for ease of removal (it just peels right off!). 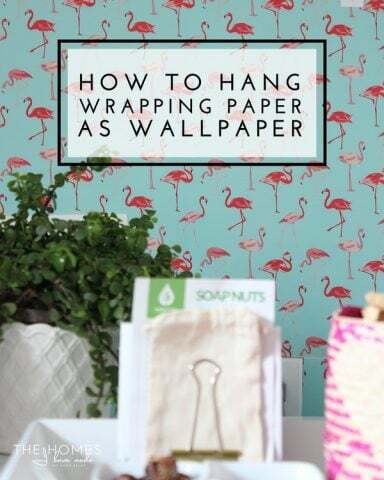 See the links at the bottom of this post for more tips, tricks, and tutorials for buying and using various wallpaper products. Paddle Scraper – Some wallpapers come with some sort of smoothing tool, but I just love the wide size and shape of this one for big projects like this. 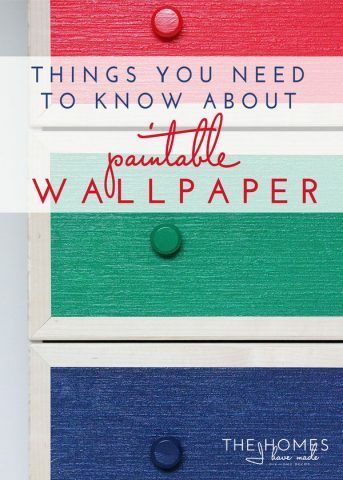 Before purchasing your wallpaper, it’s a good idea to accurately measure the space you plan on wallpapering and devise a plan for how you will use the paper. 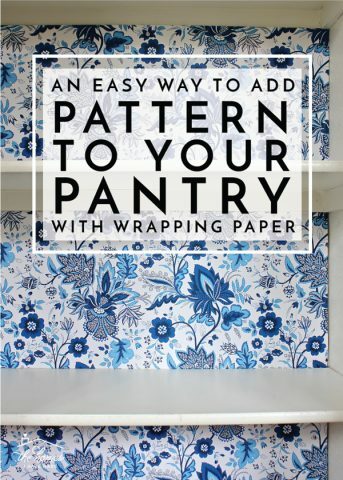 When trying to determine how much paper you need, take into account the roll dimensions, pattern size and scale, and pattern repeat information (usually detailed on the wallpaper’s web description or packaging). Also think about which orientation you will hang the paper, as that may affect how much or little you need to cover certain size areas. If the paper can be easily returned, considering buying extra (because not being able to finish when you run out of paper can be very frustrating). I mentioned before that wallpapering the backsplash was my trickiest papering job ever, and the picture above shows exactly why. 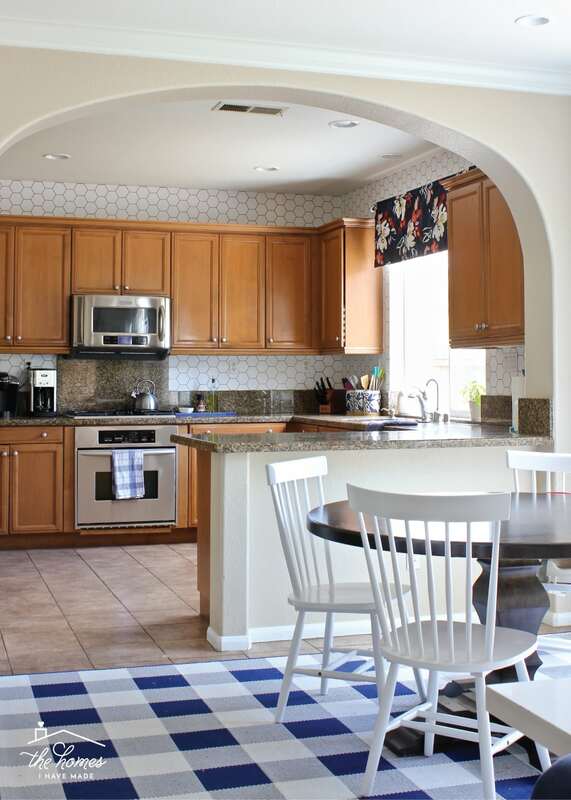 Backsplashes tend to have lots of things that need to be papered around. 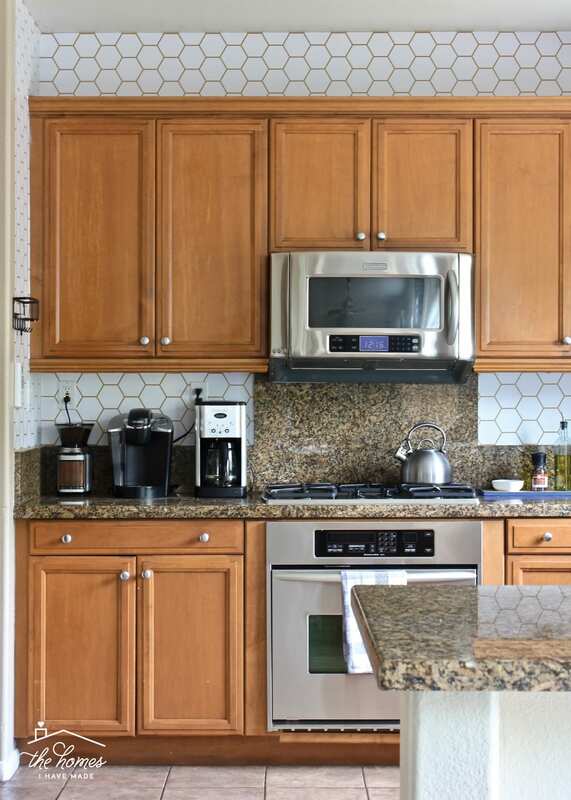 Outlets are certainly one, but your backsplash might have vents, hoods, shelves or other items that can’t be removed and need to be considered. 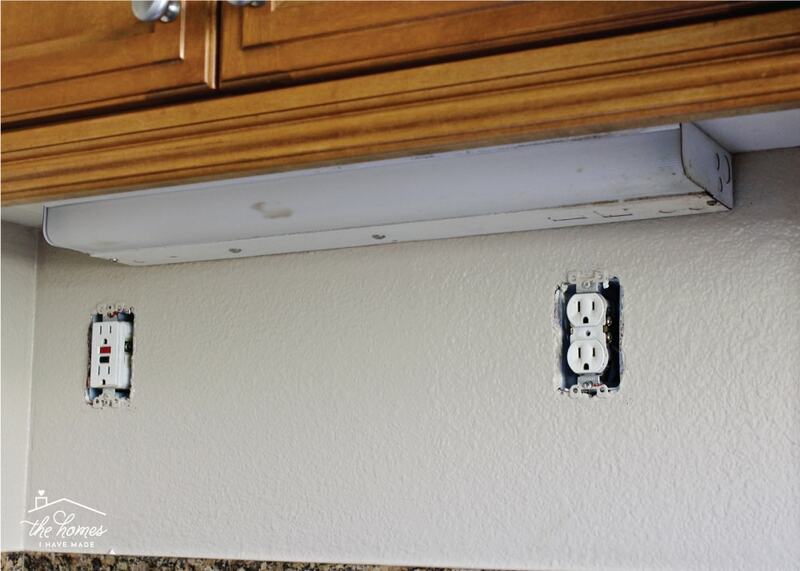 We have these under cabinet lights (that we never turn on but obviously can’t remove because….#renters); and since these lights extend pretty much the entire length of all the cabinets, they prevented me from throwing up a simple sheet of paper and calling it a day. 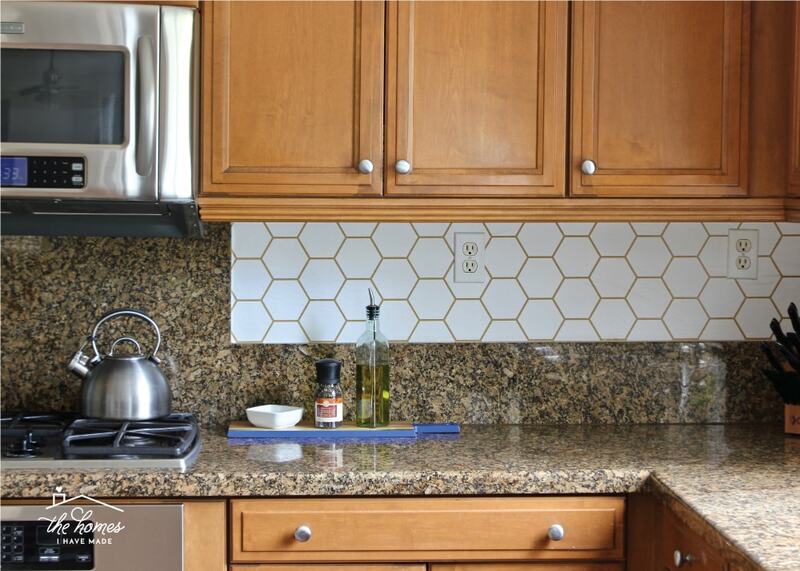 To deal with anything you need to paper around, make a detailed plan of your entire backsplash. As you can see below, I not only detailed out the length and height of each area (to the left of the stove, to the right of the stove, to the right of the window), but I also marked the exact placement of each light and outlet. On another page (not shown), I dove into even further detail, notating where precisely each feature was so I could translate those measurements to the wallpaper during the cutting phase (more on that below). With the dimensions fully calculated and notated, you can then determine how best to cut your wallpaper. 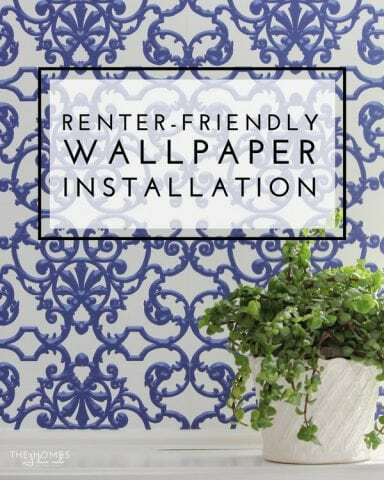 Typically, wallpaper is hung from top to bottom and you work laterally across a space. Well, I wanted to use as little wallpaper as possible (because it’s expensive) and I wanted to reduce the amount of seams I had to match. As such, I chose to apply the paper horizontally (from side-to-side, rather than top-to-bottom). While this choice certainly added to the complexity of the installation, it really allowed me to maximize every inch of paper. If you notice in the notebook above (right-hand page), I cut each strip in half (possible because of the height of my backsplash and how I chose to install it). Instead of a 10′ length of paper with lots of excess, I had 20′ of 13″ tall strips that better fit the area being papered. 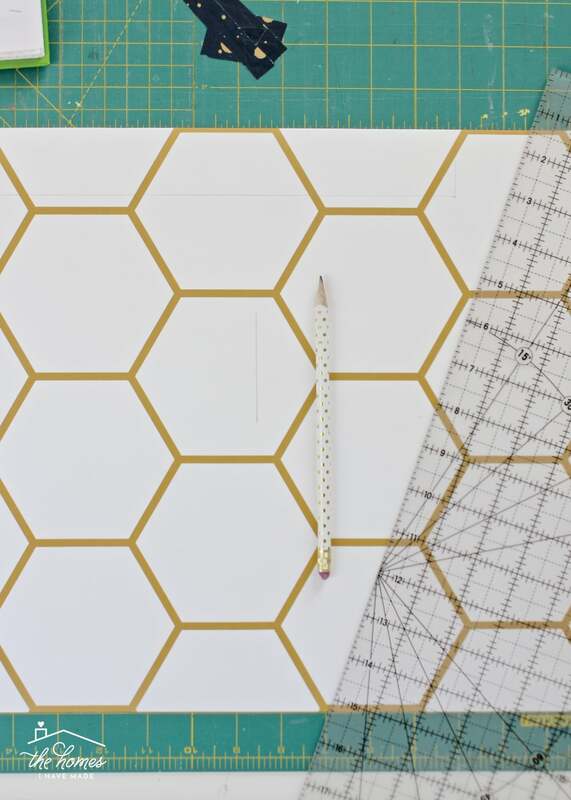 This approach may not work for you based on your pattern and orientation preferences, but my point is this: think very carefully about how you can apply the pattern and how you can cut the paper to get the most space covered as possible! 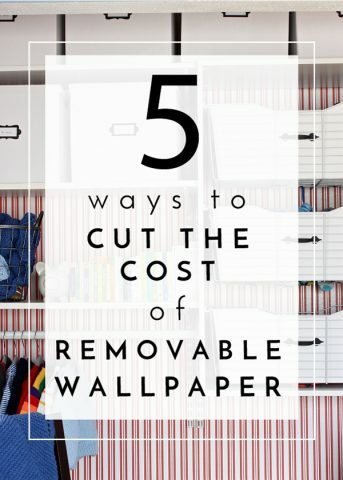 Figuring out the plan for the wallpaper may very well be your most tedious and time-consuming step. However, once you have all the measurements figured out, you just need to translate them to the wallpaper and get cutting. Start by cutting the large rolls down the sizes determined in your planning. I found it easiest to do large cuts (both length-wise and width-wise) using a rotary cutter and large ruler. When papering large expanses of wall, I usually deal with outlets and other features as I get to them (as I’m applying the paper). 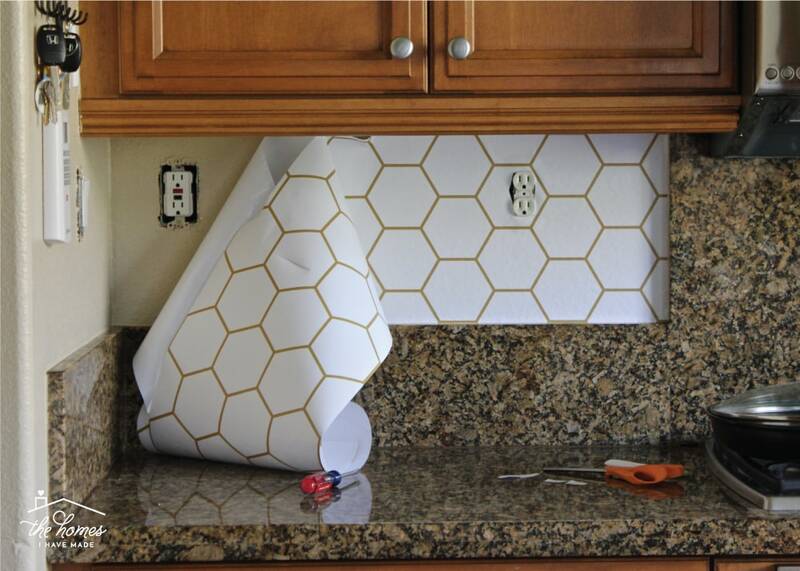 However, I found the backsplash such a tight space with so many extra features to work around, that it was practically impossible to get the paper to lay flat. After some trial-and-error, I determined it was much easier to cut each feature out before applying the paper to the wall. To do that, translate the size and placement of each “extra” feature to your wallpaper (precise size and location measurements are KEY!) to the wallpaper strip. In the photo below, you can see the faint lines of the light fixture (along the top) and the outlet (vertical line in the top/middle). 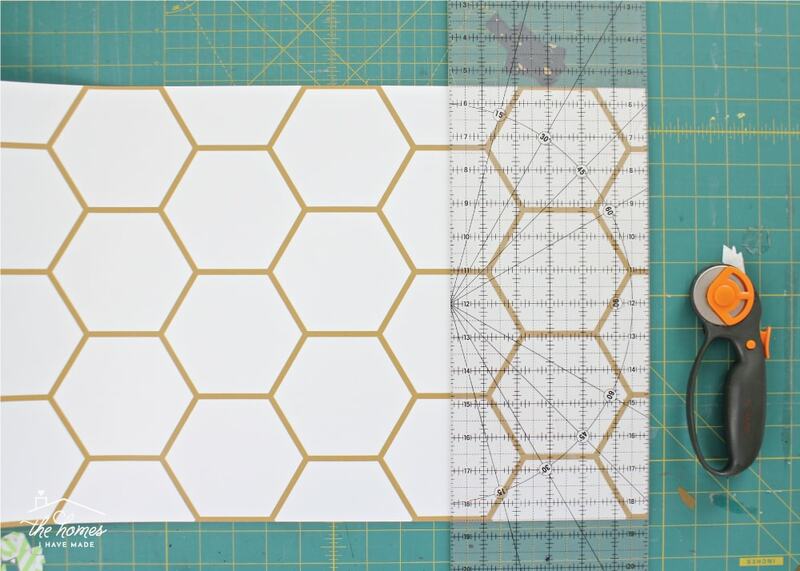 Once you have each feature measured and “drawn,” cut them out using a ruler and very sharp X-acto knife. This part can feel tedious and a bit scary (slicing big holes in the middle of your wallpaper can be a big risk!) so don’t hesitate to re-measure and double check as much as necessary! 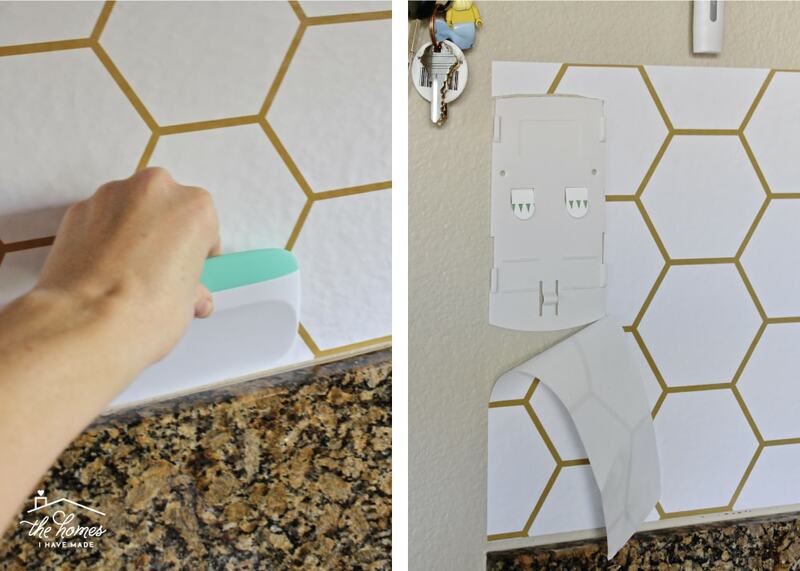 Once you have all the necessary features cut out of the wallpaper strip, it’s time to apply it! As I mentioned above, I chose to apply my paper horizontally to conserve paper and eliminate excessive match lines on such a small area. To do so, stick the lead edge of your paper strip to the wall, ensuring it is as vertically straight as possible. As you work across the wall, slowly peel away the paper backing and smooth the paper down. 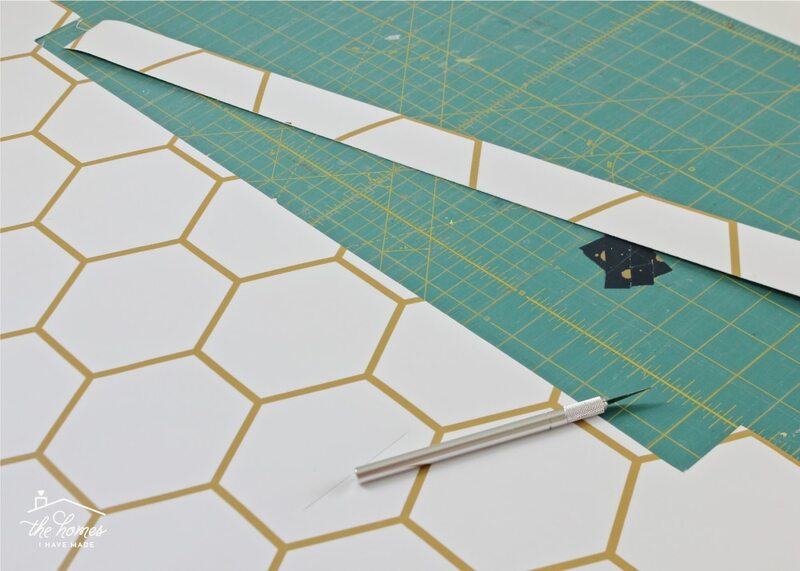 Work carefully around features such as lights and outlets and use a sharp scissors and X-acto knife to trim away extra paper as necessary (below, right). Once you get the paper in place, you can use a smoother to really adhere the paper to the wall and work out any wrinkles. Once the paper is applied, re-visit your outlets and other features to make sure sufficient paper is trimmed away and the paper is laying smooth and flat. 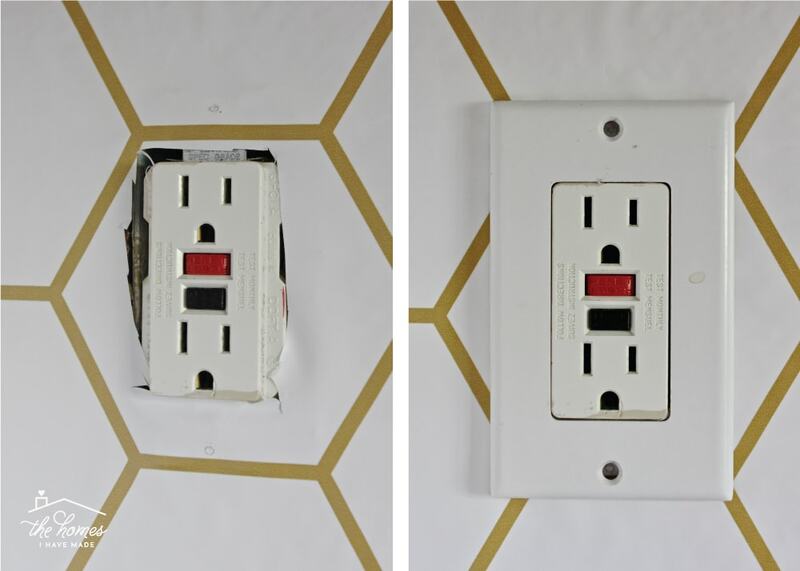 Replace outlet covers once you’re satisfied with the placement and smoothness of the application. Don’t hesitate to pull it off and re-lay it down. Whether it’s your initial 2″ or the full sheet, if it’s angled funny or has lots of wrinkles you can’t get out, simply peel the sheet off and re-stick it. I promise, it will stick again. Don’t force it. Working from side-to-side can be really tricky from an alignment perspective. If your initial 2″ aren’t quite level, the paper will only continue to “veer off course” as you move across the wall. It’s better to peel it off and re-align it instead of trying to re-route the paper further down the wall. Corners. I chose to cut long strips of paper that would stretch into and past the corners so that the pattern would continue nicely. However, getting paper to turn-the-corner straight can be very difficult. In hindsight, I would have sliced the paper at each corner and started a fresh application at each turn. The paper is REALLY durable. 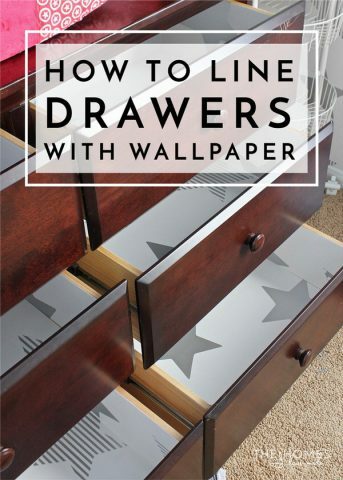 Don’t hesitate to bend, wrinkle, or curl up the paper as you’re working with it. It’s veeeery durable and once you have it smoothed onto your wall, those bends and wrinkles won’t even be noticeable. Take a step back. Despite my efforts for the smoothest application possible, I was still left with some pretty considerable wrinkles in the paper (those darn corners!). I know they are there, and up close I can see them. But during day-to-day life, I rarely notice them. That’s one of the best things about wallpaper. It’s so “big picture.” So do the best you can, step away, and just enjoy the improved view! 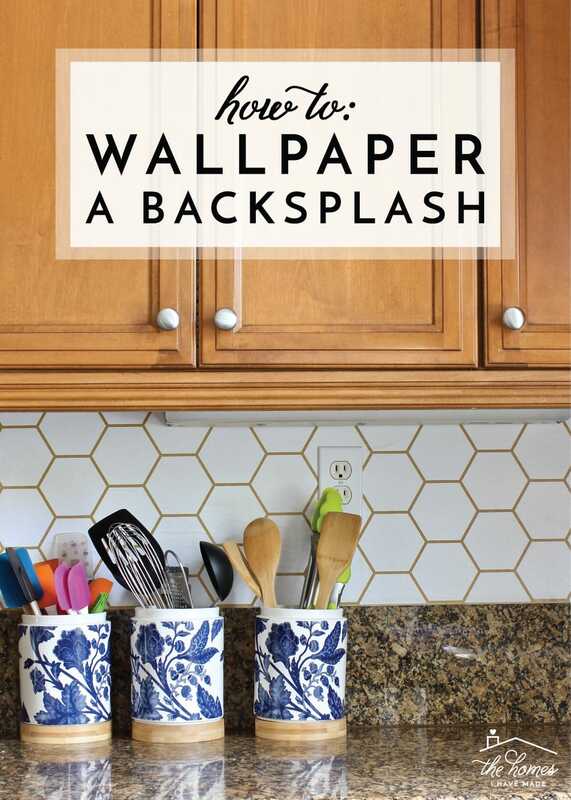 One of the trickiest things about backsplashes (tiled, painted, papered, anything!) is deciding where to stop. I am not sure there are any “rules” about where and how your backsplash should stop, as I think it’s mostly personal preference. 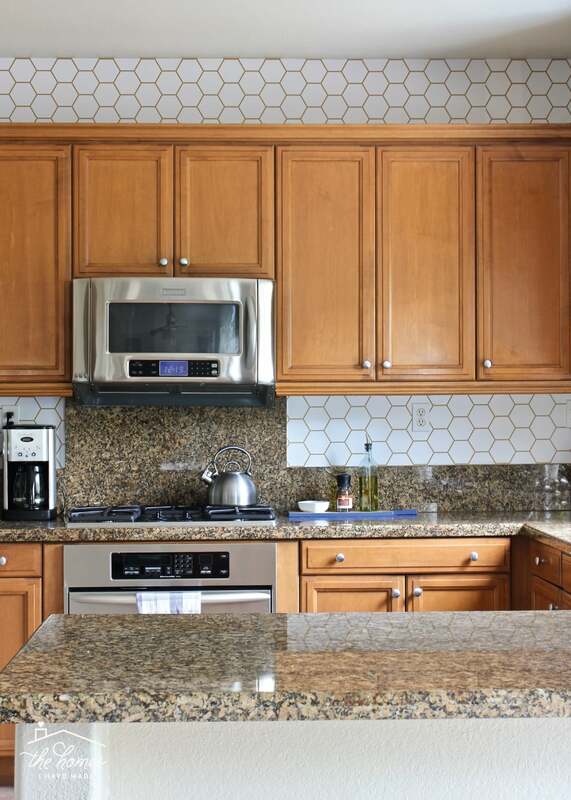 My original plan was to only tile the backsplash, and I used the width of our counters and the height of the cabinets as my guide (as seen below). But even as I stepped back, put my supplies away, and called the job done, the “tiling” really bothered me. The white paper felt random in the context of the rest of the kitchen; and instead of my eye drifting to the pretty paper, it kept drifting to the ceiling where there was none. Below is a quick snapshot I took as I debated (for weeks!) what to do about it. I finally determined that I needed to extend the wallpaper up the wall to the ceiling in order to make it work. After a quick calculation, I determined I had enough paper left (I originally bought enough to “tile” the fireplace too), and just got it installed the other night. The wonderful thing about installing the paper above the cabinets is that there was nothing to work around! No outlets, no lights! I could just cut the paper into strips and get it right up. It took me about 90 minutes to add the rest of the wallpaper up the sides and all the way around the kitchen. I’d say it was time very well spent! We lived with just the backsplash done for about 2 months before I finally did the rest, and to say the change was dramatic is an understatement. 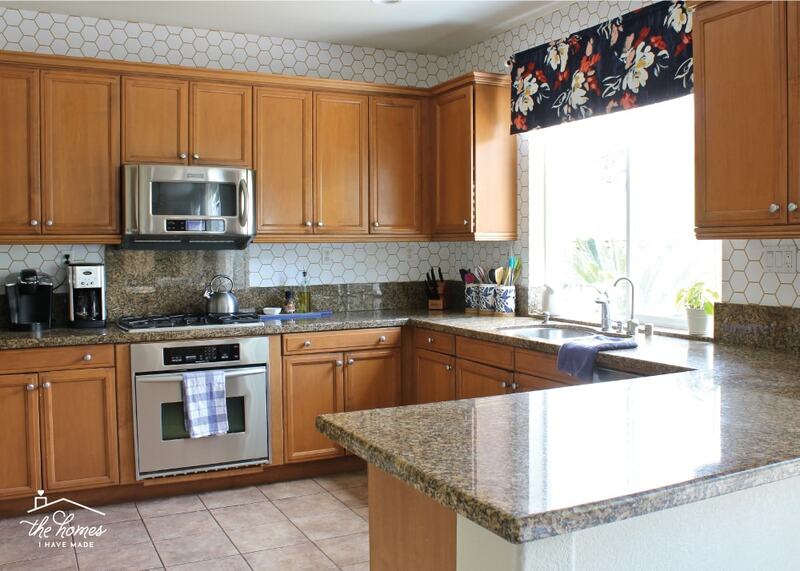 The wallpapered backsplash went from feeling random and disjointed to providing a fun and fresh detail that really woke up our kitchen! 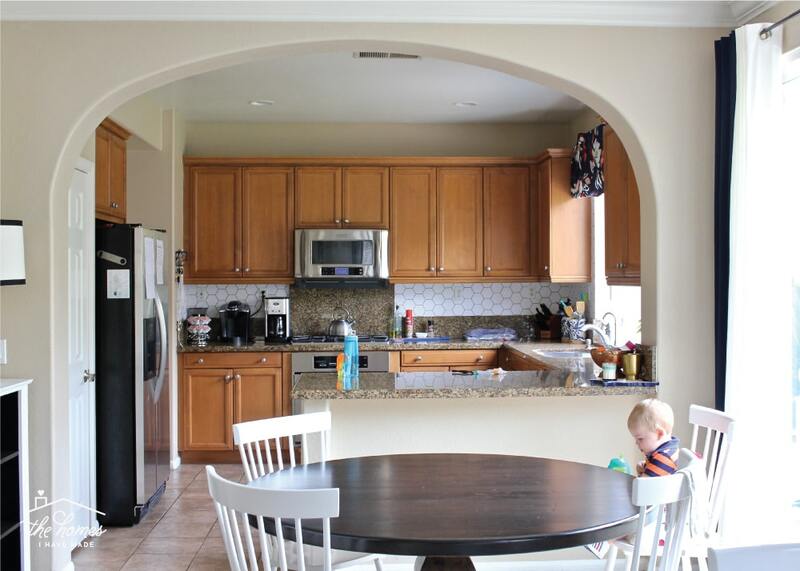 You guys know I will just never be able to get over the brown cabinets and the brown counters and the brown floor in this house. But little-by-little, these small temporary changes are helping me like this space more. Photographing this space is tricky but the light and lens actually cooperated with me this week so below is a shot of how things in this space are coming together…and I dare say…I like it! I’ve got two small organization projects to wrap up in here and an easy cutting board craft I’ll show you next week before I can call this space done! Whether you’re a renter or not, I know most of us have aspects of our homes we just don’t love. I hope this tutorial not only shows you a fun and creative way to change up your space (in a totally temporary way!) but also inspires you that even small, seemingly insignificant or unnecessary changes can help us love the home we’re in just a little bit more! 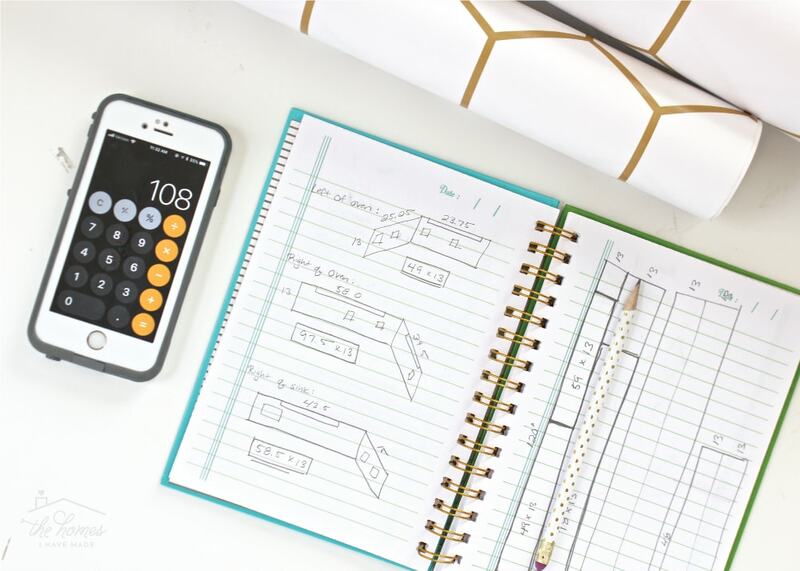 I did not receive compensation for this blog post; however Walls Need Love did provide the wallpaper for me to use and review. Please remember that I only work with brands and products I fully support and that make sense for my home, my family, and this blog. All opinions are 100% my own! 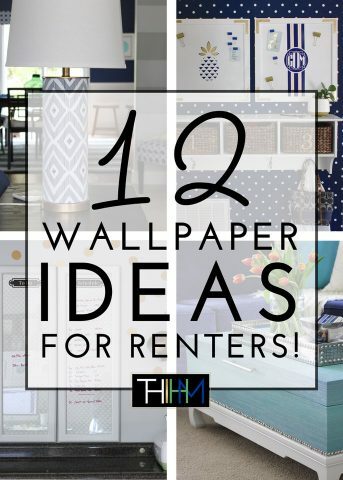 Looking for more great wallpaper projects? I’ve got you covered!